When does the pursuit of self-interest go too far, lapsing into morally unacceptable behaviour? Until the unprecedented events of the recent global financial crisis economists often seemed unconcerned with this question, even suggesting that "greed is good." 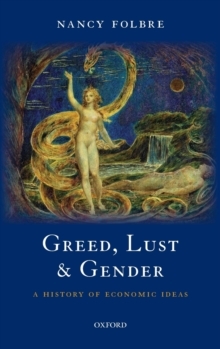 A closer look, however, suggests that greed and lust are generally considered good only for men, and then only outside the realm of family life. The history of Western economic ideas shows that men have giventhemselves more cultural permission than women for the pursuit of both economic and sexual self-interest. Feminists have long contested the boundaries of this permission, demanding more than mere freedom to act more like men. Women have gradually gained the power to revise our conceptual and moralmaps and to insist on a better-and less gendered-balance between self interest and care for others. This book brings women's work, their sexuality, and their ideas into the center of the dialectic between economic history and the history of economic ideas. It describes a spiralling process of economic and cultural change in Great Britain, France, and the United States since the 18th century that shaped the evolution of patriarchal capitalism and the larger relationship between production and reproduction. This feminist reinterpretation of our past holds profound implications for today'sefforts to develop a more humane and sustainable form of capitalism.